Many people know nitrous oxide as laughing gas. In our office, we administer nitrous oxide to enhance patient comfort and relieve anxiety for patients of all ages. After you're comfortably seated in the dental chair, you'll inhale the gas (a nitrous oxide and oxygen mixture) through a face mask. We will control the amount of nitrous oxide you receive to ensure your safety. You will begin to relax and will not recognize pain so the dentist can perform your dental work while you stay completely comfortable. 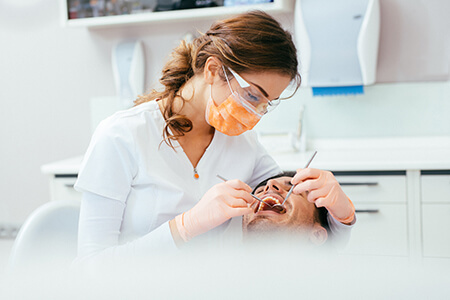 The effects of nitrous oxide subside once we remove your mask, so if nitrous is the only anesthesia you receive, you will be capable of driving yourself home following the visit and can continue your daily activities as normal.